Sammy Sosa was plenty embarrassed last week when he was forced to admit that the back injury that put him on the disabled list came from violent sneezing. Is Sammy watching one of his long balls, or getting ready to sneeze? "It would have been better if I had run into the wall or had a fight with somebody," Sosa told reporters. Well, perhaps Sosa, as well as those who chuckled at the Cubs slugger's injury, should have done their research. They would have found that the situation was hardly unique, nor was the cause of injury among baseball's most embarrassing. Sneezes, which can travel through a person's body at speeds of up to 100 miles per hour, have taken many players out over the years. How quickly we forget that Juan Gonzalez's back acted up last spring after a bad sneeze. And at least three other players were scored "DL-Sneezing," pitchers Marc Valdes in 1995, Russ Springer in 1997 and Goose Gossage in 1985. "I'm embarrassed as hell," Gossage said at the time. "But they say it's one of the most common ways (to hurt your back). You drop a bar of soap and hurt it. Or you put your shoes or socks on and hurt it. It happens." Wade Boggs knows about the shoes. In the mid-'80s, Boggs was in a Toronto hotel as Red Sox were in town to play the Blue Jays. When Boggs attempted to pull off his cowboy boots, he lost his balance, fell hard against the couch in the room and sprained the muscles in his back. 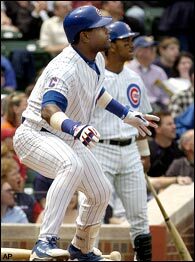 Not only has Sosa missed appearances at the plate because of a sneezing fit, he also missed the 1998 Home Run Derby and the All-Star Game because of a sore shoulder. Sosa told reporters it was a result of him sleeping awkwardly. Bad pillow positioning also resulted in a stiff neck for outfielder J.D. Drew, who missed a few games, and concern about a lack sleep once took Randy Veres off the baseball field. 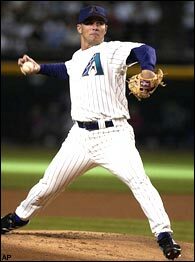 On the night of August 20, 1995, Veres, pitching for the Marlins (the same team Valdes also pitched for in '95), was trying to go to sleep in a Pittsburgh hotel, but the people in the room next door were making too much noise. To get their attention, Veres punched the headboard on the bed several times and suffered a swollen tendon in his right pinkie. Three decades before "Veres-gate," Jose Cardenal missed a game because of crickets in his hotel room. He didn't try to punch them. He just showed up to the ballpark too exhausted to play. Sleepwalking gave us a serious candidate for baseball's most interesting injury, courtesy of outfielder Glenallen Hill. In 1990, the Blue Jays rookie couldn't play a game against the Seattle Mariners because he injured himself while trying to escape a nightmare about spiders. It didn't help that Hill suffered from arachnophobia -- fear of the eight-legged creatures. In an effort to get away from the imaginary creatures, Hill climbed the stairs in his apartment and scraped his knees and elbows on the carpet. "When I woke up I was on a couch and my wife, Mika, was screaming, 'Honey, wake up,'" Hill, held up by crutches, told reporters at the stadium the next day. In order to corroborate his alibi, Hill offered reporters the chance to come to his apartment to see the blood stains on the carpet. 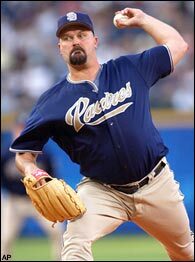 There's definitely an air of mystery surrounding David Wells' injury. Indeed, the home is an extremely dangerous place for a baseball player. Home was the site of David Wells' latest accident, which occurred last week, and put him on the 15-day disabled list. The Padres pitcher said he lost his balance after kicking a 40-pound iron bar stool. According to Wells, when he fell he was holding a glass and subsequently cut his left hand and a tendon in his right wrist. "I don't have any reason to lie," said Wells, who has a penchant for off-the-field chicanery. "I'm not trying to cover anything up. It was an honest and ridiculous accident." Home is where George Brett suffered his 19th injury in an eight-year span. On June 7, 1983, Brett was in his house doing laundry and listening to a Cubs game on television when the announcer said that his friend Bill Buckner was heading to the plate. In an effort to catch the at-bat, Brett slammed his foot against a door and fractured one of his toes. Home is where Bob Stanley almost ended his career. In 1988, the 13-year Red Sox veteran fell down the stairs while taking out the trash. He landed on a glass bottle and injured nerves and tendons in his pitching hand. Stanley underwent four hours of surgery but eventually made it back on the diamond. And home is where St. Louis catcher Mike Matheny's 2000 season ended, when he severed two tendons and a nerve on his right ring finger, after he cut himself with a hunting knife he received as a birthday present. Sharp objects have consistently been a challenge for baseball players. In 1985, Giants pitcher Greg Minton showed up at spring training hurt, after he drove a nail through the middle of his pitching hand while trying to shoe a horse. Padres pitcher Adam Eaton missed a start after stabbing himself in the stomach with a small knife while trying to cut the shrink wrap off a DVD. Eaton needed two stitches. Children also present trouble for players. Pitcher Paul Shuey fell asleep while holding his baby and suffered a knot in his shoulder. Outfielder Brian Jordan injured his back while picking up his son at Disneyland and reliever Don Aase pulled something in his back while picking up his daughter from her crib. Outfielder Ruben Sierra once showed up to the ballpark with a sprained ankle, thanks to chasing his daughter on a mall escalator. At least Sosa's sneezing injury wasn't career-ending, like Mario Valdez's was three years ago. The Oakland rookie made the 2001 team out of spring training, but after bruising his left knee when he took a bad step off the team bus, he never played in the major leagues again. Knuckleballer Steve Sparks, now with Arizona, apparently once thought he had super strength. And the circumstance was far from as embarrassing as the reasons why Brett Barberie and Steve Sparks had to ride the pine. In 1995, Barbarie -- then playing second base for the Marlins (what was with that team?) -- was making nachos with fellow infielder Rich Renteria before a game. After cutting chili peppers, Barbarie washed his hands, but they apparently still had some chili oil on them. When he put in his contacts, his eyes started burning. Barberie subsequently had to toss his contacts in the trash and call in his scratch from the lineup. "This is brutal," Barberie told reporters. "This will go national. This will be on ESPN." Even that incident pales in comparison to Sparks, who dislocated his shoulder in spring training in 1994 with the Brewers, after he tried to imitate the acts performed by two men who visited the Brewers earlier in the week. The men, who were part of a motivational group called Radical Reality, ripped apart phone books with their hands. The only thing Sparks succeeded at was dislocating his shoulder for the seventh time in his career. The previous six times were unrelated to phone books or sneezing. Darren Rovell, who covers sports business and freak baseball injuries for ESPN.com, can be reached at Darren.rovell@espn3.com.